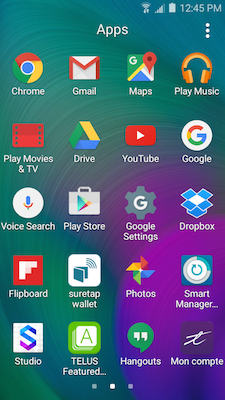 Galaxy A5: How do I delete all of my personal information from my Samsung Galaxy A5? Your device lets you perform a factory reset to delete all of your personal information from the device. This feature ensures your data are removed before sending the device in for replacement or repair, properly disposing of the device, or giving the device to a friend or family member to use. Warning: Your personal information cannot be recovered after using this feature. Please save any information you need prior to using this feature. 3. 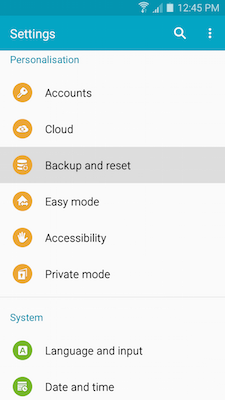 Scroll to and touch Backup and reset under the Personalisation tab. 4. Touch Factory data reset. 5. Review the information provided and touch RESET DEVICE. 6. If you have a security lock set on the device, you will be prompted to enter the lock information before proceeding. 7. 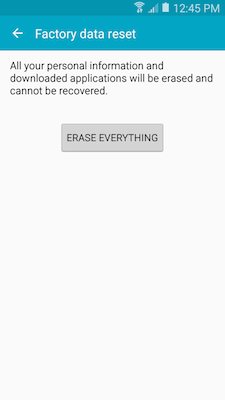 Touch ERASE EVERYTHING to delete all information and downloaded applications. 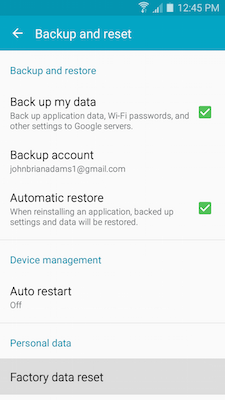 The process may take a few minutes while your device removes your personal data and restores the Android™ platform to its original state. You can reinstall any downloaded or purchased applications from Google Play™ store. 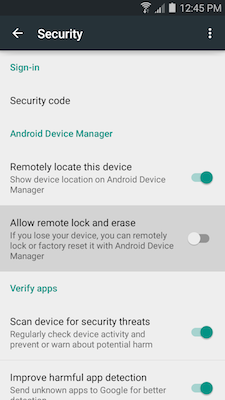 Google™ offers the Android Device Manager application, which lets you track your Android device's location and reset its memory remotely. Both location services and the erase feature must be turned on and active on the device. 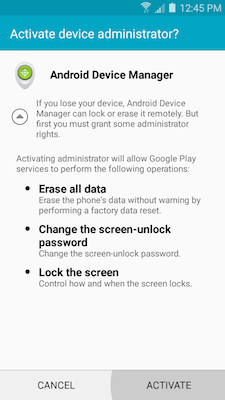 Important: The Allow remote lock and erase feature must be activated on the device prior to using Android Device Manager to reset your device's memory. 2. Touch Google Settings . 3. 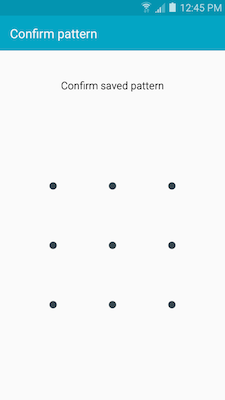 Scroll to and touch Security. 4. Touch the slider next to Allow remote lock and erase to turn it on . 6. 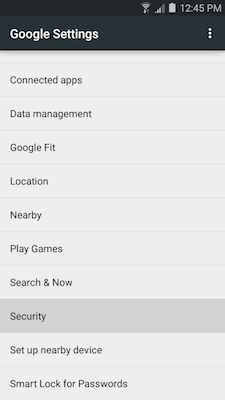 From your computer, sign in to the Android Device Manager webpage using the Google Account associated with the device you want to locate. 7. Click Accept to let the application send the location data to Google. 8. An interactive dialog box displays in the top-left corner. 10. Click Erase again to confirm deletion. 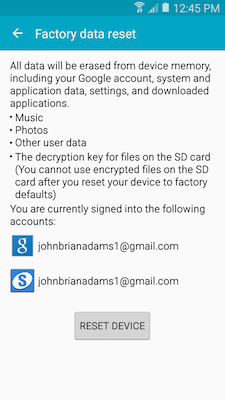 How do I transfer data from my Google™ Account on another NFC device to my Galaxy A5?